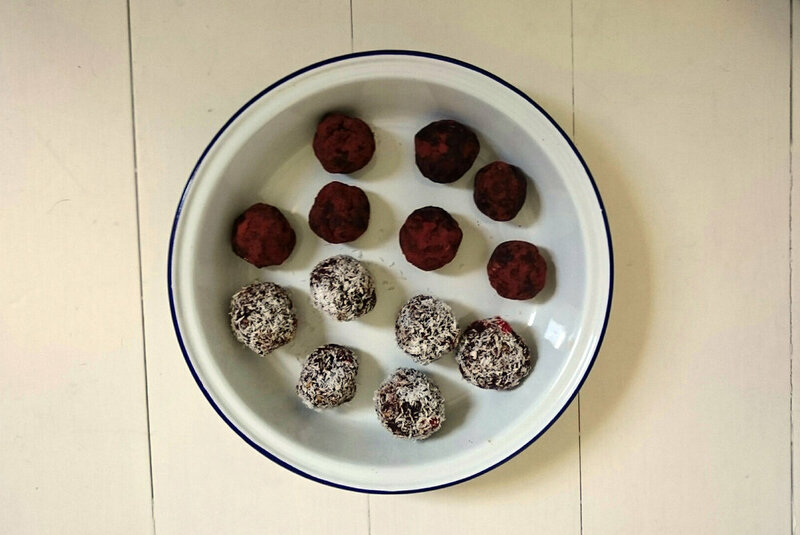 These little chocolate nuggets are packed with superfoods, designed to nourish and energise the body. Goji berries are high in antioxidants, a powerhouses of vitamins, minerals and health-giving carbohydrates and protein. The nuts contain ‘good fats’, maca is incredibly nutrient rich and is good at balancing the endocrine system and supporting adrenal health. The super greens help detoxify and eliminate toxins from the body as well as being full of vitamin C, B vitamins, folic acid, potassium, iron, zinc and copper. 2. Put the cashew/almond nut butter, maple syrup, cacoa powder and melted chocolate in a food processor and blitz to combine. 3. Add the remaining ingredients and process to form a dough. 4. Chill in the fridge for around 4 hours, or overnight, to firm. Or place in freezer to firm up. 5. Use a spoon to scoop out the mixture and roll into 16 walnut sized balls. 6. Roll in a little shredded coconut, crushed nuts, cocoa. Then place on some baking parchment to set. Little squares of goodness, but still a delicious treat. Sweetened with fruit and maple syrup, and packed with seeds, nuts, whole grains and of course carrots! Figs have long been renowned for their ability to improve fertility and boost libido. Ground almonds and oats provide protein, and hemp seeds are high in Omega 3. 1. Preheat the oven to 200 degrees / 180 fan 2. Melt the coconut oil over a low heat 3. Line a 20 x 20 cm baking tray with parchment. 4. Put half the oats in a processor and blitz until you have a scruffy flour. Tip this oat flour and the rest of the whole oats into a large mixing bowl. 5. Blitz the figs, maple syrup and 4 tablespoons of water until its a thick but textured syrup. Scrape into the bowl with the oats. 6. Grate the carrot and apple into the large mixing bowl, add the coconut, pumpkin seeds, vanilla, spices and melted coconut oill. Mix well. 7. Spoon into the baking tray. Smooth over with back of a spoon, bake for 40-45 minutes until golden brown. 8. Allow to cool a little in the tray, then turn out onto a rack. Once cool slice into 16 squares.